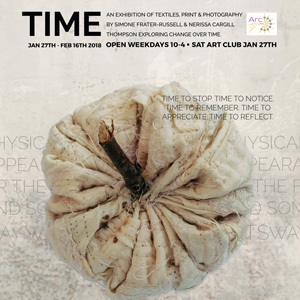 At the end of January, I will be teaming up with fellow textile artist Simone Frater-Russell for an exhibition at Arc – Arts for Recovery in the Community in Reddish entitled Time as we both explore change over time, be that physical shape and appearance or the fleeting, ethereal and sometimes unreliable way individuals recall events or people. Simone’s work documents the nature of memory, while mine encourages the viewer to stop and look closer, to find beauty, value and purpose in the old and discarded. There will be an opening event on 27th January where we will both speak about our work plus there will be family friendly making activities to get involved in. For more making, you can book a place on our Hygge panel workshop where you can have time to reflect on your happy place and create a fabric collage response embellished with embroidery to take home.